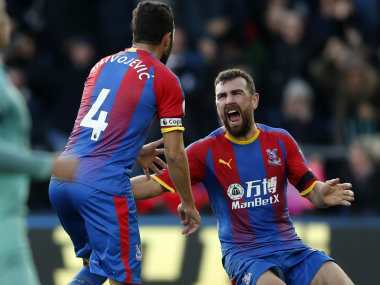 London: Arsenal's 11-match winning run came to a dramatic end as Luka Milivojevic's late penalty rescued Crystal Palace in a contentious 2-2 draw on Sunday. 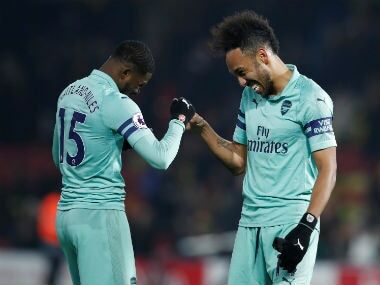 Unai Emery's side failed to win a 12th successive match in all competitions as they fell short of the club's record of 14 victories in a row. Arsenal fell behind to the first of two Milivojevic penalties just before half-time at Selhurst Park. Granit Xhaka equalised with a sublime free-kick before Pierre-Emerick Aubameyang poked in his ninth goal of the season in controversial circumstances. Arsenal striker Alexandre Lacazette flicked the ball to Aubameyang with his hand, but officials failed to spot the offence. Angered by that blow, Palace felt justice was done when Wilfried Zaha won a second penalty with seven minutes left and Milivojevic slotted home again. It was a frustrating afternoon for Emery, whose captain Mesut Ozil reacted angrily when he was substituted in the 68th minute, the German throwing his gloves to the floor after stomping past the Arsenal manager. 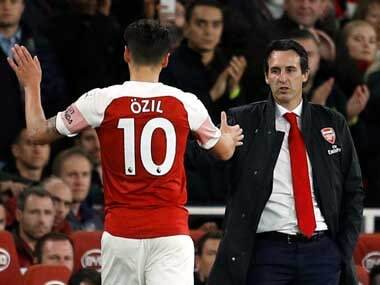 It was the latest flare-up between the pair after Ozil was reportedly angered by Emery's demand that he work harder in matches earlier this season. Arsenal remain fourth in the Premier League, but missed the chance to keep pace with leaders Liverpool, who are four points clear of the north Londoners. "I'm disappointed with the result but our work is good. We drew, it's not bad, it's better to win but looking at the game in 90 minutes it is a deserved result," Emery said. "After the second goal, we were on a good result, but I knew we needed another goal for calm." Palace boss Roy Hodgson was furious with Arsenal's dubious second goal, saying: "I'm not even happy to end up with one point especially when you see how clear the handball was. Most people will have sympathy with us." 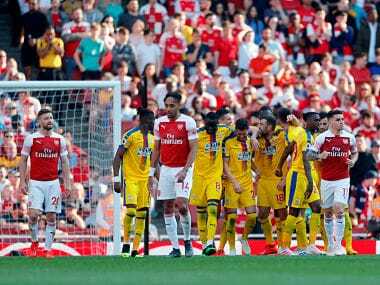 Emery's team had made a habit of getting off to slow starts this season before flourishing in the second half and another sluggish opening left them creaking under intense Palace pressure. Hodgson's men appealed for a penalty after Jordan Ayew's run was halted by Shkodran Mustafi. On that occasion, Palace's claims were turned down by referee Martin Atkinson, but on the stroke of half-time they were given a spot-kick. Bernd Leno made a hash of punching clear from a corner and a panicked Mustafi needlessly lunged into Cheikhou Kouyate. Palace captain Milivojevic missed a penalty in their defeat at Everton last weekend. Unfazed, Milivojevic kept his nerve this time to send Leno the wrong way from the spot. Having finally scored their first home league goal this season at the fifth attempt -- a futile streak that lasted 417 minutes -- Palace needed to keep Arsenal at bay after the break. However, it took only six minutes for Xhaka to equalise as the Gunners yet again turned on the style in the second half. The Swiss midfielder smashed a superb curling free-kick into the far corner of Wayne Hennessey's net from way out on the right flank. Arsenal had seized the momentum and they snatched the lead in the 56th minute. 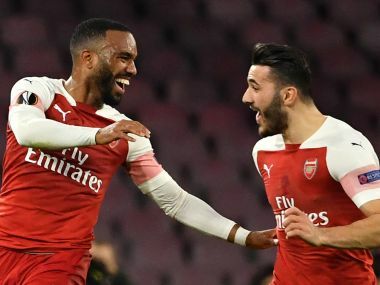 When Lacazette rose to meet a cross, the French striker's raised hand clearly made contact with the ball, diverting it to the unmarked Aubameyang. Lacazette's offence was missed by Atkinson and Aubameyang stabbed home at the far post, with goalline technology confirming his effort had just crossed over before Hennessey pushed it out. Max Meyer hit the outside of a post as Palace pushed for a leveller and the hosts felt justice was done when they won another penalty in the 83rd minute. Zaha tricked his way past Xhaka and tumbled to the turf, his fall convincing Atkinson, if not the Arsenal players, that it was worthy of a spot-kick. For the second time, Milivojevic was coolness personified as he drilled past Leno to end Arsenal's winning run.